1.Line up the screw point directly over the center of the cork making sure it's not at an angle, the cork could break off if the screw is not straight. 2.Next, hold the top of the bottle and base of the opener with one hand as you twist the handle of the screw with your other hand. 3.The wings will move toward the top as you twist the screw. To remove the cork press the wings down and the cork will be pulled up. 4.After removing cork, fold the wings back up and untwist the cork. Dimensions: 9.2 inches long, 3.7 inches wide, 1.9 inches high. PREMIUN MATERIAL. The wine opener is sturdy. Its heavy zinc alloy construction and glossy surface gives it an elegant, dignified appearance that complements any commercial kitchen, bar, or home. Do not contain harmful metallic element to your health. BOTTLE OPENER KNOB. It also functions as a bottle opener which easy to get glass soda lids and beer bottle tops off easily. 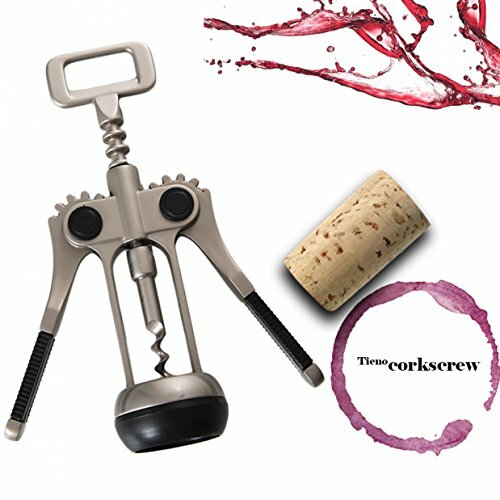 Make it a 2 functions Winged Corkscrew. NON-SLIP WINGS and Round Collar. Each wing has a rubberized sleeve gripped handle for the ultimate control and durability. Grip firmly when push down the wings to extract the cork. A longer body and non-slip round bottom collar that fits most types of bottle necks for easily seating the Zinc Winged Corkscrew on top of the bottle. SHARP SCREW TIP. Easy to screw into the cork. Won't chews up the cork and end up with cork pieces all over the counter. Also can be used in lieu of a knife to remove any foil or wrapper that is around the bottle's neck. 100% MONEY BACK GUARANTEE and NO-RISK PURCHASE. We have confidence in our products. If for any reason, the product doesn't fit your needs, we would provide a full refund for the wing corkscrew if your request. View More In Wing Corkscrews. If you have any questions about this product by TIENO, contact us by completing and submitting the form below. If you are looking for a specif part number, please include it with your message.